Yesterday was a sad day in history – the world lost a true innovator, an intelligent person, and someone who changed the world in more ways than we realize. I have never met Steve Jobs, yet when I clicked on http://www.apple.com and was greeted by the large B&W portrait of Steve with the simple phrasing of “Steve Jobs, 1955-2011”, a chill ran through my body. I stared at my monitor screen in disbelief. ‘What? He was dead? He can’t be! There’s so much more for him to do!’ We all knew he wasn’t doing well when he resigned as CEO of Apple, but I don’t think any of us expected his death to be this soon and certainly not on the day when the new iPhone was announced. This morning a thought popped into my head: Between my husband and I, we own over 10 Apple products! It’s really amazing how Apple’s technology has affected the work we do. I really cannot imagine how I would be able to be the business owner, photographer, graphic designer, and blogger that I am today, without my Apples. Actually, I CAN imagine… Moment of confession here: I wasn’t always a Mac user – I was a PC user for a long time. *face-palm* but then in 2006, my smart cookie husband convinced me to make the switch. Folks, its 100% true, once you go Mac, you can’t go back! Steve Jobs knew exactly what he was doing from the time when he and Steve Wozniak were tinkering with parts in the garage, all the way up until now. The Mac machine is a beautifully designed piece of work. It has changed the way I do my work, making it 100x easier and more enjoyable. It has probably changed it in ways that I can’t even think of. 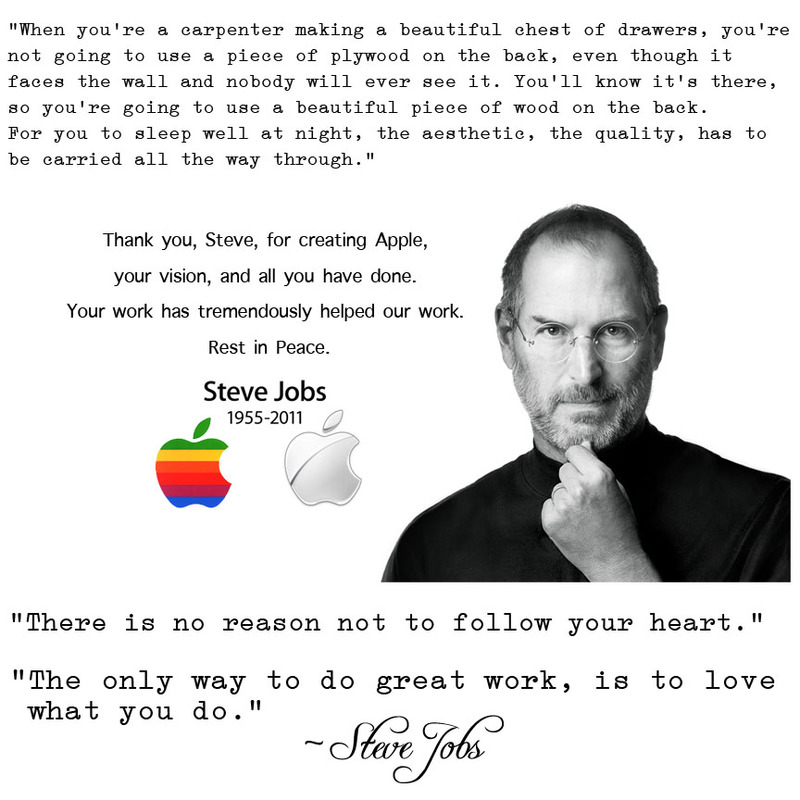 Thank you, Steve Jobs, for all your great work and for helping us do great work. We couldn’t have done it without you, your team, and your innovation. There needs to be more people in this world with your type of mind. We are happy and forever grateful you continued to think different. This entry was posted in Computers, Quote of the week and tagged Apple, homage, quote, Steve Jobs. Bookmark the permalink.